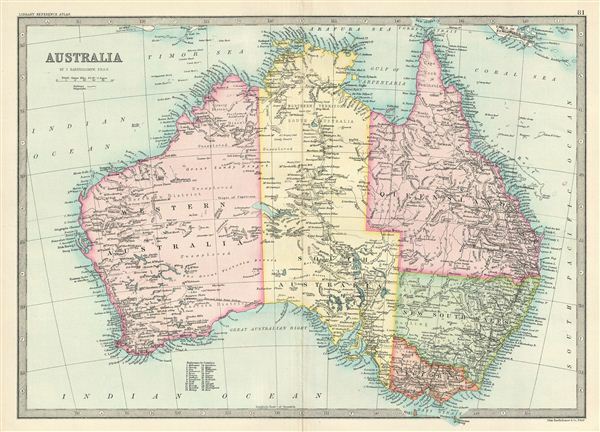 This is a fine example of Bartholomew's 1890 map of Australia. It covers the entire continent from the Torres Strait south as far as the Bass Strait. Australia, divided into its five provinces of Western Australia, South Australia, Queensland, New South Wales and Victoria is depicted in. The 'Proposed Land Grant Railway' is noted. Several regions are highly detailed while there are some regions that are marked 'Unexplored.' Various towns, cities, railways, roads, rivers and several other topographical details are noted. The map is color coded according to provinces. This map was issued as page no. 81 in Bartholomew's Library Reference Atlas. Bartholomew, J., Library Reference Atlas of the World, (Edinburgh) 1890. Very good. Minor wear on original fold line.